Top Level Domain (TLD) is the term that appears after the domain name. For eg. abc.com, here “abc” is the domain name and “.com” is the TLD. Below are few well known TLD’s .net, .org, .edu, etc. There are other types like .digital, .music, .blog and some are location specific like .in (India), .uk (United Kingdom), .dk (Denmark) etc. There is a variety of TLD’s available for webmasters to choose from. Recently a new TLD was introduced to the internet, namely .app. By reading the name it obviously gives us an idea that this TLD is suitable for a domain which has Application. 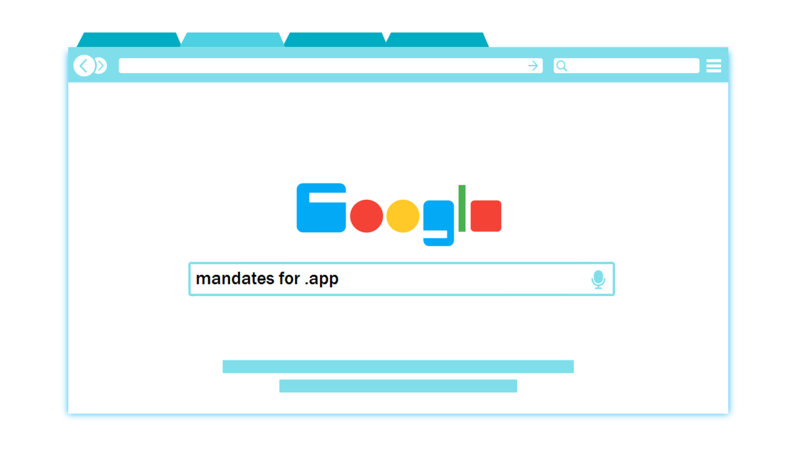 Google has started offering the .app top-level domain (TLD) to the public to register their required domain name from 8th May 2018, it is aimed at capturing the app developers. However, it could be used by others also. Earlier there were approx. 280 TLD worldwide with 248 of them were country codes ccTLD’s (.in, .uk). And at least 20 generic TLD (.com, .org and .net). This has been possible because Google purchased the .app rights from ICAAN 2 years back for a large sum. We all are familiar with the term SSL Certificates or HTTPS, Google’s recent accouchements have made clear that Google is working religiously on its “Safe internet for all” motto. Talking further on Google’s motto, the .app has created a major milestone to lead the industry by being the first TLD which requires the website to have HTTPS and communicates through it, though .app is the obvious choice of app developers, as over 100,000 domain names were registered in the Early Access Program for an additional fee, also .app domains can now be registered with any major domain registrar, and the popularity keeps growing. Kindly bear in mind that the packet first reaches the HTTP, then if it is not redirected to HTTPS. Browser shows an error message. Most of the major websites follow HSTS (HTTP Strict Transport Security) which helps to directly go from HTTP to HTTPS. Domain owners having their websites on HTTP connections will not be allowed to connect to their sites unless they secure it via HTTPS. Many of us would be wondering why having HTTPS is so important? Here is a small read on 5 risks involved in not having an SSL on your website, which will clear your mindset on SSL Certificate. After the general availability period .app domains can be registered with any domain registrar. And some of them are also offering SSL certs in a package to help the domain’s rollout.